Black is the new Black. At least for me! I don’t think it was intentional at first, but black seems to be the accent color in my home. 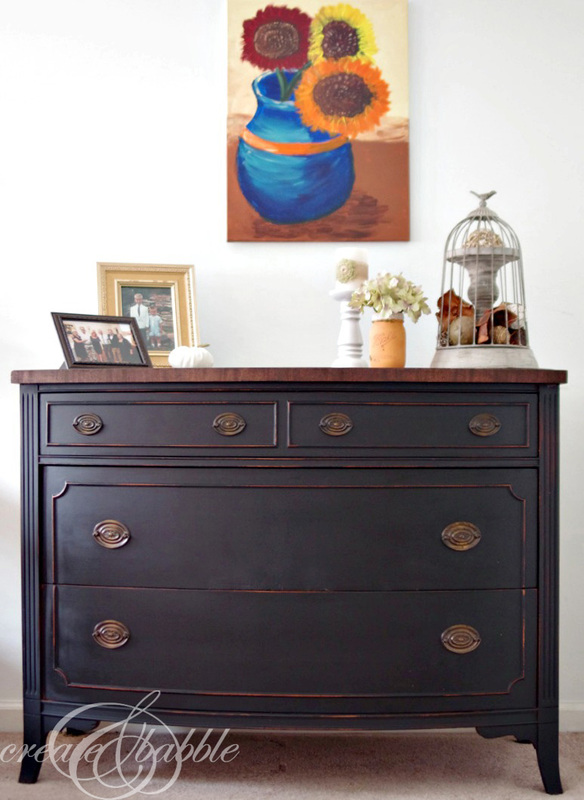 So when I found this dresser in serious need of a makeover, I immediately knew I wanted to paint it with Miss Mustard Seek Milk Paint in Typewriter. Miss Mustard Seed describes Typewriter as an off-black or soft black. It is named for the black color traditionally found on antique typewriters. 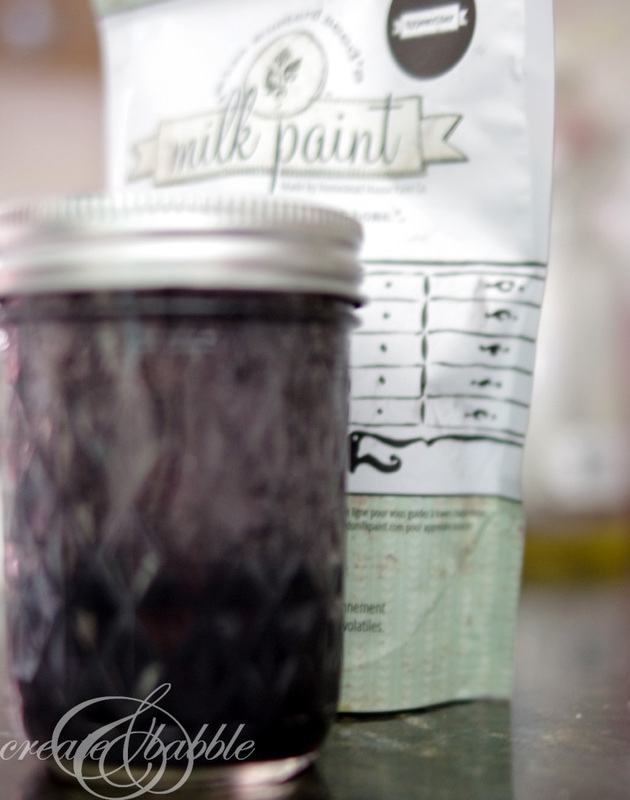 Let’s get right to the after photo and then I’ll tell you about my tips for working with MMS (Miss Mustard Seed) Milk Paint. First of all, I decided that since the top of the dresser was in pretty good shape I would just sand off what was left of the finish and then restain it. I used Dark Walnut by Minwax. The rest of the dresser got a good cleaning with TSP followed by a thorough rinsing and drying. If you don’t want a “chippy” look (which I didn’t), the MMS Milk Paint line has a Milk Paint Bonding Agent that you add to the milk paint mixture. 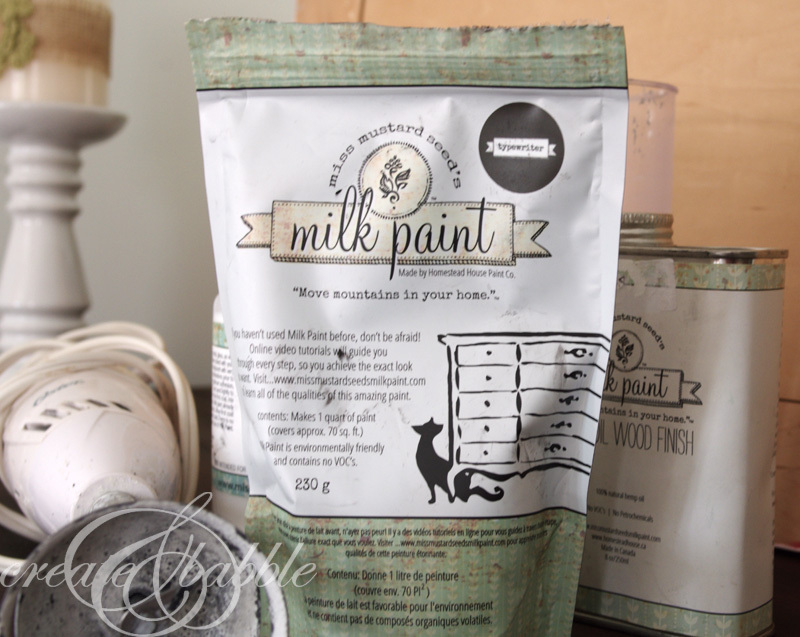 The Milk Paint Bonding Agent allows Milk Paint to adhere to metal, glass and painted, varnished or lacquered surfaces. Even though I would distress the edges of the dresser, I did not want an overall chippy appearance. 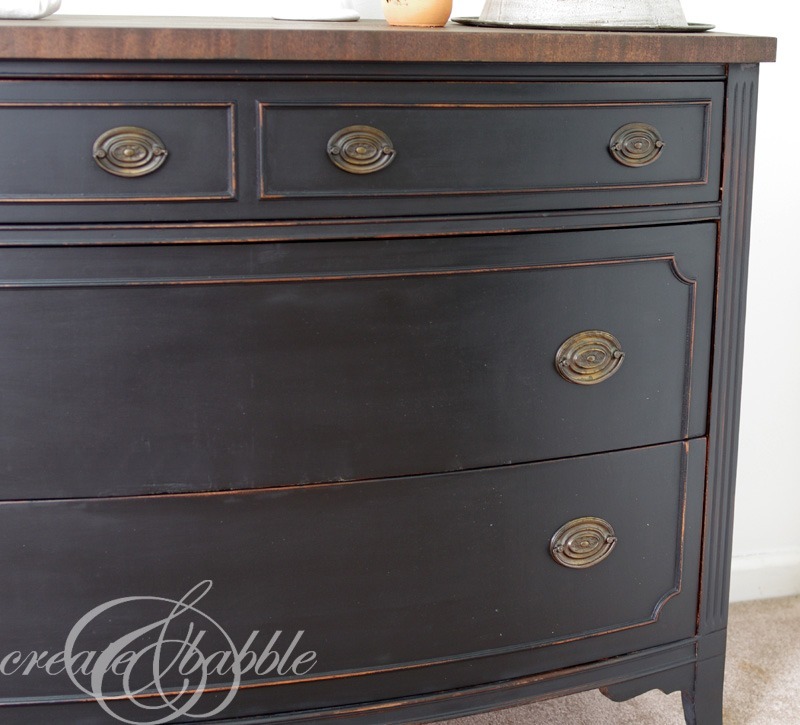 The sides of the dresser were a just a bit glossy and I was afraid the paint might not adhere well there and turn out flaky and chippy, so I added the bonding agent to the first coat of milk paint. 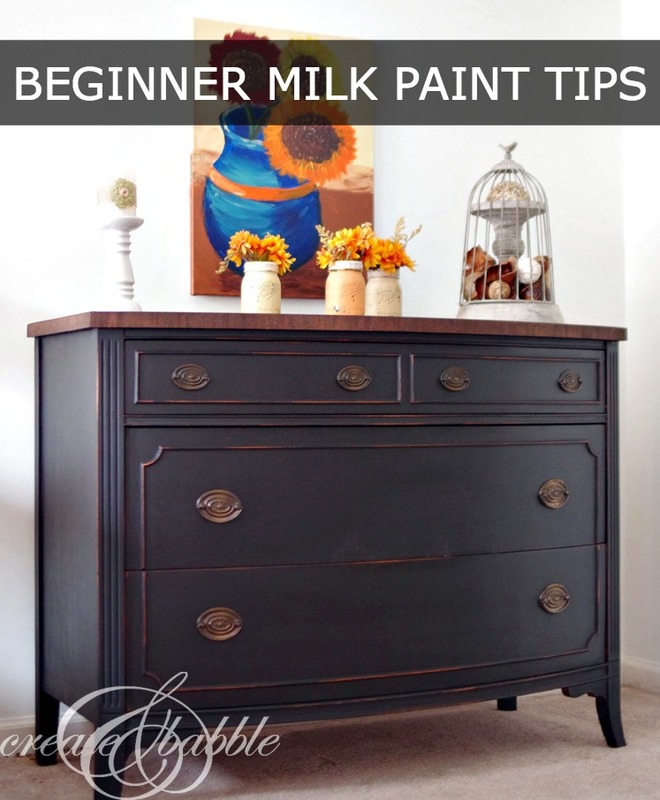 Use a mixer or blender of some sort to mix the milk paint. Stirring with a spoon or using a whisk didn’t get out all of the lumps for me. 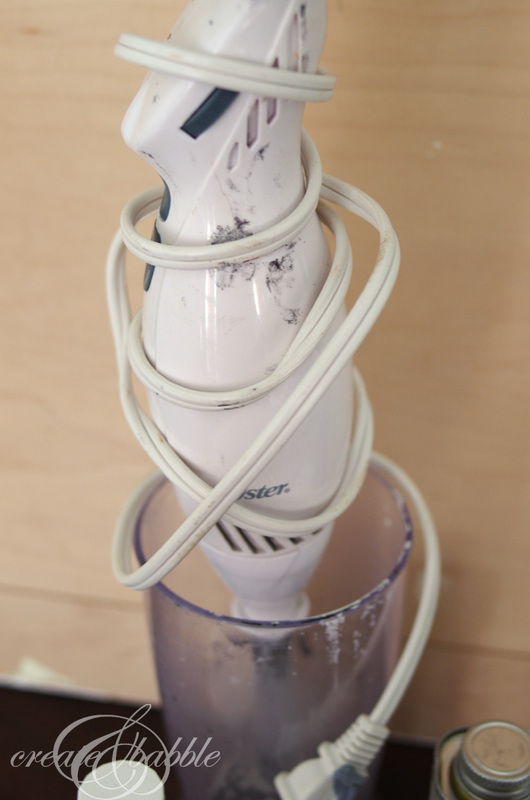 I have an old immersion style blender that is dedicated for paint mixing. If you don’t have an old one, maybe keep an eye out for one at your local thrift store. As you are painting, stir the milk paint with your paint brush as the paint tends to separate as it sits. Also, since I can rarely finish painting a piece of furniture in one sitting, I store any leftover mixed paint in a little mason jar with a securely closed lid. After the second coat was dry, I distressed the edges a bit with a sanding sponge. Instead of wax, I decided to try out the MMS Hemp Oil to finish the dresser. MMS Hemp Oil is all natural, so it’s great for to use if you are sensitive to chemicals. MMS Hemp Oil will absorb into the painted surface and give it a durable finish. I simply just wiped on with a clean cloth and wiped away the excess. 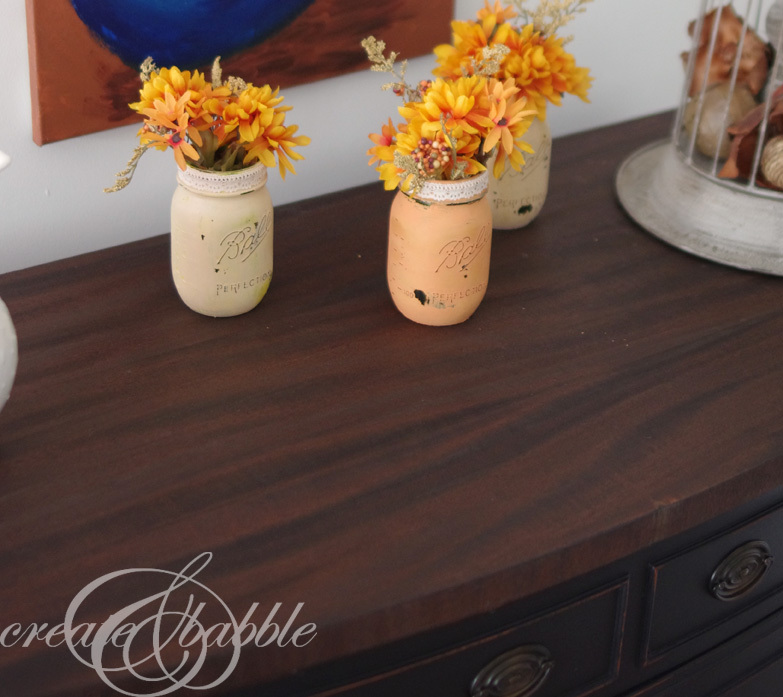 I just love how this dresser turned out. Dan was a little jealous when I said it was going to my daughter’s house for my grandson’s bedroom. “Typewriter” by Miss Mustard Seed Milk Paint is definitely my new favorite and I’m sure I’ll find more furniture pieces to makeover with this paint. 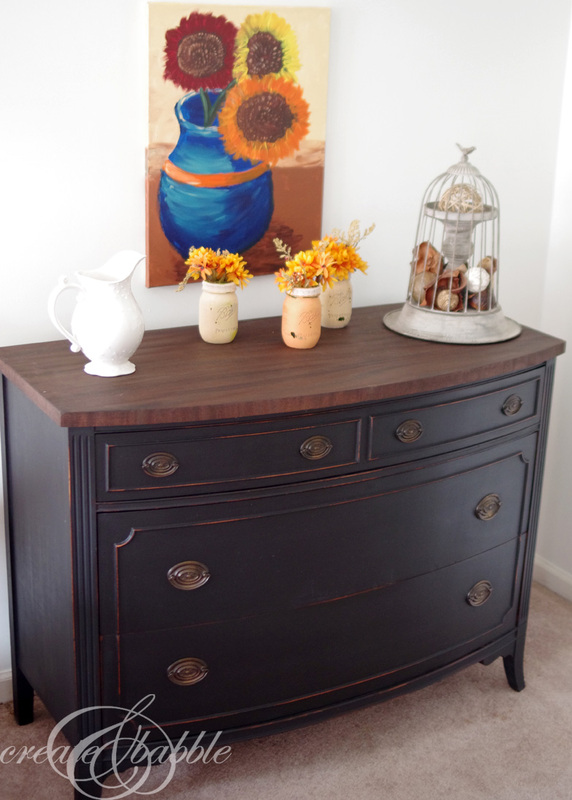 Have you used MMS Milk paint? What is your favorite color? So sophisticated and gorgeous! I’m jealous, too. Thank you Susan! I know – we like it so much I HAVE to another piece in that color! Beautiful job Jeannie! I don’t think I could let it leave my house. I hope to try her milk pain in the future, but currently the only local source for it is about a half hour away! And, I have to find the right piece to paint! Thanks Maureen. You will love it. It’s very easy to work with and I love all her colors. Thanks friend! Yes, you have to try it…you’ll love it. Thanks for pinning! Gorgeous makeover! I’ve had typewriter sitting on my paint shelf for months and haven’t used it yet. This pretty makeover has inspired me to find a piece in my stash to paint with this color. I’ve been curious about the Hemp Oil too but haven’t tried it. 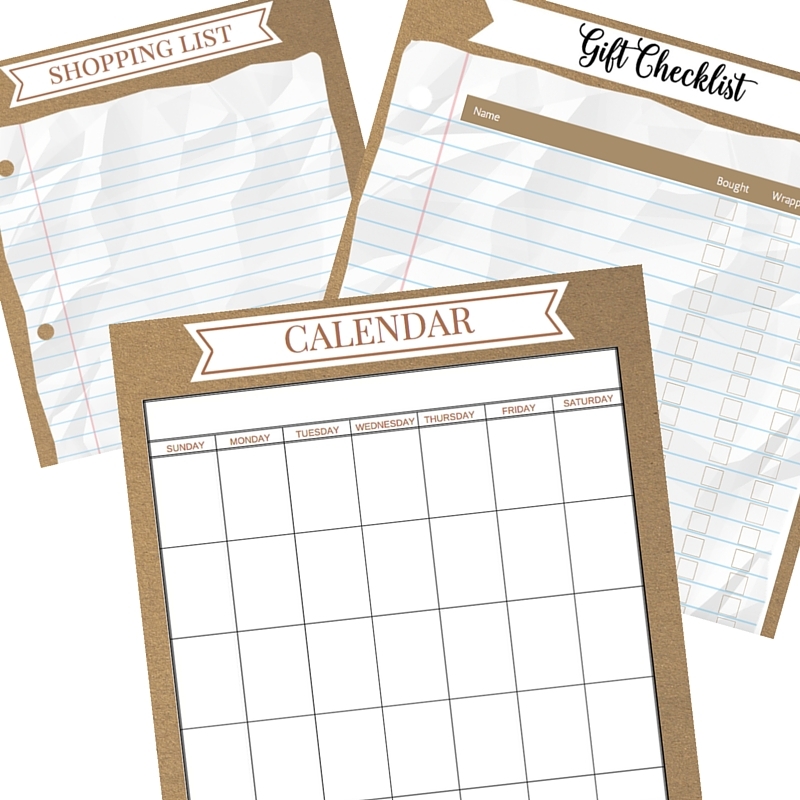 I just put it on my shopping list. Thank you Marie! You will love the typewriter, I guarantee it! I’d love to see what you makeover with it. I was hesitant to try the Hemp Oil, but I really like it. What a beautiful makeover!!! Visiting from Savvy Southern Style. 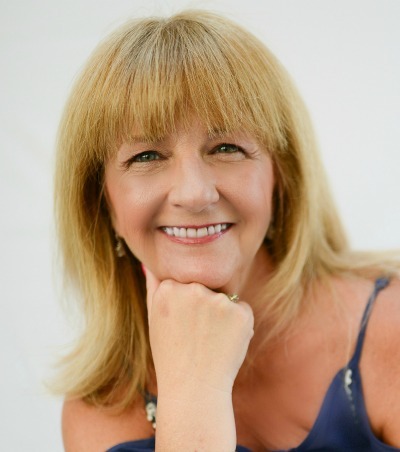 Thank you Dee! 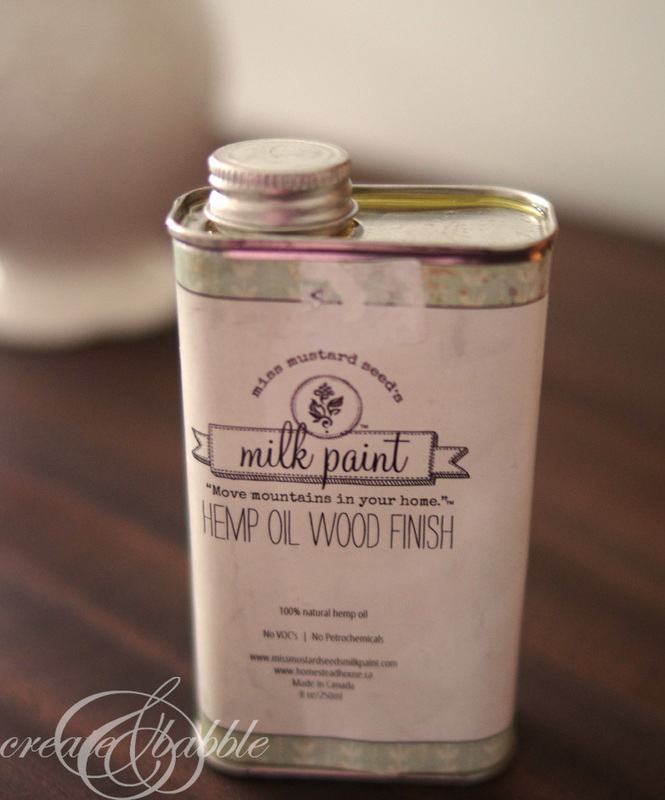 I’m sure you will love working with milk paint. Thanks for pinning! What a beauty! Love the whole dresser! How lovely! I have not yet used MMM, so I appreciate the tips — and I’m not big on chippiness. But this turned out beautifully. I saw your link at Twirl and Take a Bow/House on the Way. I am in love with this piece!!! As soon as I saw it at the party, I knew it had to be featured! Stop by House on the Way tonight at 8pm to see it featured! Thanks for sharing at the Twirl & Take a Bow Party! Thank you Leslie! That is so kind of you! I love this color and definitely will have to try it out. Great job! Thank you Betsy. It is a perfect color and now one of my favorites! 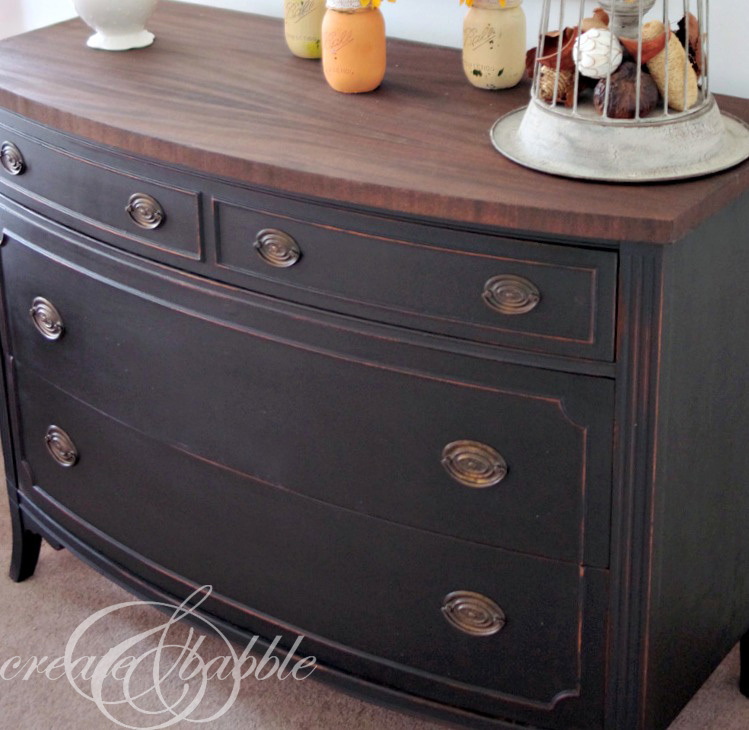 Your dresser is gorgeous Jeanie! I’m with you on the color, it’s fabulous. Thanks for sharing with Creative Spark Link Party. Thank you Glenna! I love sharing at your party! So pretty! Typewriter is my favorite color although I haven’t used it yet. 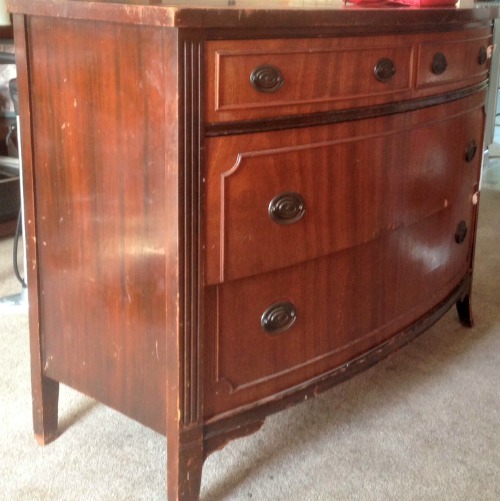 Thank you for the tips – I have a dresser that needs painting. Did you paint the hardware? Thanks! Thanks Patti! No, I didn’t do a thing to the hardware. I thought about it, but in the end decided to leave them as is. 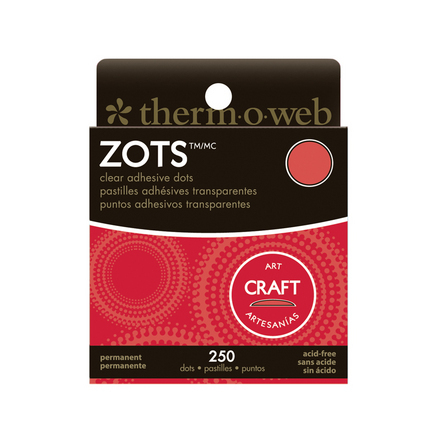 Amy @ Ms. Toody Goo Shoes recently posted…Easy Cranberry (Awesome)sauce! Amy, thank you very much – for the sweet comments and pin! I was afraid it might be too dark, but I worried for nothing! I’d love to see the dresser after you do it. 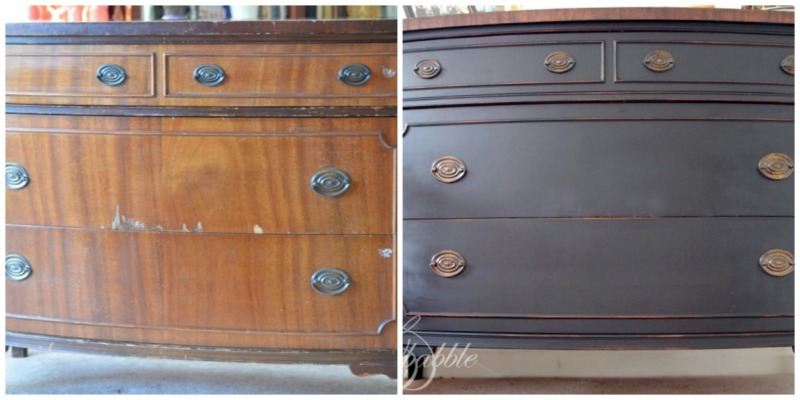 Love how your dresser turned out. Beautiful job Jeanie! Thank you so much Kristi! I was a little nervous to use such a dark color, but now it’s a favorite. Hi there, the whole thing is going sound here and ofcourse every one is sharing data, that’s genuinely excellent, keep up writing.